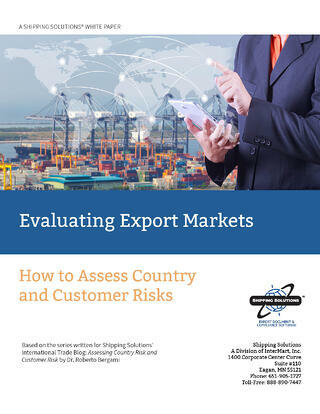 If you aren’t properly evaluating potential export markets and customers, you could be putting your company at risk. Whenever you look at new export customers and markets, there’s always a chance something could go wrong. While you can’t completely eliminate that possibility, there are specific steps you can take to identify potential risks, analyze and evaluate them, and take the proper precautions. In this white paper, you’ll learn what those steps are, so you can avoid dealing with unsavory characters—and potentially losing a lot of money. Identify bribery and corruption risks. Understand and manage bank risk. Use industry and government resources. Understand regulations and documentation requirements. Like what you see? Share this white paper now.